Because aviation is so vital to today‘s economy, potential flight risks need to be eliminated or minimized to prevent costly and tragic consequences. This is why safety standards are applied to key aspects such as aircraft design, engineering and maintenance, navigational aids and communication systems, and flight safety protocols and procedures. The Air Commerce Act of 1926 was the first bill to regulate civil aviation in the United States. The bill required pilots and aircraft to be tested and certified, enforced proper investigations of air accidents, and established airplane safety procedures and navigational aids. For aviation professionals, proper training and safety awareness is imperative for flying and maintaining aircraft. Today, the U.S. Federal Aviation Administration (FAA) is responsible for licensing pilots, aircraft maintenance technicians, aircraft, and airports. One of the biggest concerns with aviation is controlling air traffic. With so many airplanes and helicopters in the skies, and on the taxiways and runways, keeping order and avoiding collisions is an ongoing process. For airports, maintaining airfield lights and a line of open communications with pilots is necessary for air traffic control. Today, pilots rely on a combination of instruments, inertial navigation systems, radar, global positioning systems (GPS), and terminal collision avoidance systems (TCAS) to pinpoint their location and the location of nearby aircraft. All this equipment helps reduce the possibility of errors. Severe weather and outside safety risks can also pose problems. These risks include volcanic ash, birds, lightning, ice and snow. Volcanic ash is rare, but will close down nearby flight routes if necessary. We just saw that happen in Europe stranding passengers for days until the skys cleared. Lightning does occasionally strike aircraft, and part of an aircraft’s design allows for the lightening to travel through the aircraft and discharge through devices called static wicks. Special inspections are required after a lightening strike and often result in repairs to the damage caused. Bird strikes do occur, and can cause engine failure, windshield or other substantial aircraft damage. In response, new aircraft engines and windshields are designed and tested to handle collisions with birds. Ice - Aircraft can also be designed to withstand ice from building up on the wings, and tail surfaces, which can cause a decrease in lift and effectiveness of the flight controls. This is accomplished by inflatable leading edge boots or by runing hot air (engine bleed air) through ducting to the areas that are susceptible to ice. The main danger with ice and snow remains with the removal procedures, where airports are required to remove ice and snow as quickly and efficiently as possible just prior to the aircraft taking off. 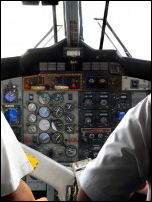 Problems with the aircraft or aircraft components can also lead to safety risks. These problems include electrical, mechanical or hydraulic component failures. They also include metal fatigue that result in cracks, or materials that become delaminated or corroded. These risks are minimized by the continuous inspections performed on the aircraft and all aircraft articles. The FAA mandates strict rules for examining and certifying an aircraft for service. The aircraft inspectors and maintenance technicians who perform the inspections and repair work are also subject to extensive training and certification processes. Since the horrific events of September 11, 2001, airplane safety discussions have been focused on forms of terrorism, such as hijacking, and aircraft and airport bombing. The FAA international aviation authorities have responded with a comprehensive list of safety procedures. These include stricter airport security measures, aircraft cockpit security, the use of random air marshals, and the exchange of information with law agencies such as the CIA and FBI. Understanding airplane aerodynamics and flight theory is essential for anyone involved in the aviation industry. Aviation quality assurance is a system for monitoring aviation equipment, programs, and procedures to ensure that the Federal Aviation Administration (FAA) quality standards are being met. For more information and updates regarding airplane safety, sign-up for our free Newsletter.